HARARE – In a significant development which could signal the beginning of fresh dialogue to normalise politics in Zimbabwe, President Emmerson Mnangagwa says he is open to talks with opposition leader Nelson Chamisa, the Daily News can exclusively report. 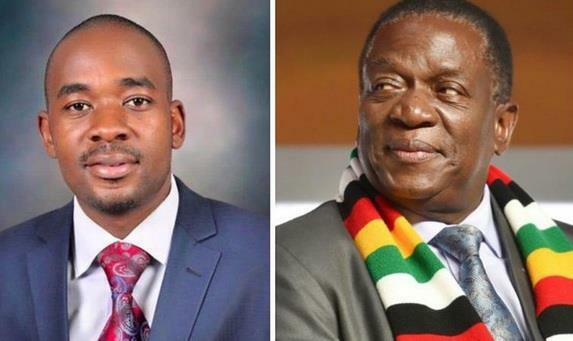 However, Mnangagwa added yesterday, any such dialogue would be on the strict understanding that Chamisa and the MDC recognised the Zanu PF leader as the legitimate winner of the hotly-disputed July 30 presidential election. This comes after Chamisa and his key lieutenant Tendai Biti told the Commission of Inquiry probing the August 1 shootings in Harare which left at least six civilians dead that political dialogue was the only solution to ending the country’s political and economic crises. Speaking in an interview with the Daily News yesterday, Mnangagwa’s spokesperson George Charamba also revealed that the Zanu PF leader had held talks with Chamisa in the run-up to the hotly disputed July 30 polls — with the opposition boss allegedly moving to scupper the positive dialogue subsequently. “There was an extraordinary amount of goodwill which they fluffed. One hopes that goodwill still subsists … but anyway, now that they have given that indication, let’s wait for the commission to make its recommendations and then move forward and see how this action pans out. “But a key pre-condition is that there must be a recognition of ED as the winner of the 2018 elections … there are no two ways about that,” Charamba said emphatically. The presidential spokesperson also appeared to suggest that Mnangagwa had struck a deal with the late popular MDC leader, Morgan Tsvangirai — which could have been of immense benefit to the development of the country. “It was a forward looking agreement, but it appears that the MDC leader was interred with his vision that he had for this country. “His youthful successor (Chamisa) did not realise that there were certain things that had been struck by the two leaders, which would have carried this nation forward, and forward in amity. “What you are looking at is some takeover without a handover (MDC succession). Chamisa did not realise that there was prior dialogue to the structure which he has no assumed leadership of, a dialogue that went ahead of the party, a dialogue that was national in outlook. “He (Chamisa) jettisoned it. He fouled it. But I would still say better late than never, now that I am seeing he is coming round,” Charamba added. Appearing on Monday before the Commission of Inquiry that was appointed by Mnangagwa in September to probe the deadly post-election violence which left at least six civilians dead in Harare, Chamisa and Biti said Zimbabwe would only move forward if the country’s leadership was prepared to engage in political dialogue. “We have a political legitimacy issue that can only be resolved through what you have already alluded to — political dialogue. “That is why we have insisted that political dialogue is the way forward, and we have put on the table a five-point plan. “Let us have a path to nation building, a path to peace building. That is what we have put on the table. But Mnangagwa does not have an appetite for it,” Chamisa told the commission. “That is why we are saying we will use democratic tools to bring him to the negotiating table to resolve the legitimacy issue. That is our trajectory,” he added, noting further that a regional-led dialogue had led to the 2009 government of national unity (GNU) between Zanu PF and the MDC. However, Chamisa did not say whether he was pushing for political dialogue that would result in another GNU. Biti also told the shootings commission that without political dialogue, the country would remain trapped in conflict and economic turmoil. “We do have a political crisis in Zimbabwe … it affects every walk of our life and it has affected the economy. Ninety five percent of the citizens are unemployed, there is no cash at the banks, the citizens are overtaxed. If you are not battered politically, you are battered economically. “The political crisis in Zimbabwe is suffocating and chocking to the ordinary citizen. Elections permanently destroy us. The election should not be a reason for divisions. move our country forward,” Biti said. Charamba complimented this yesterday by saying the statements by the two opposition kingpins were a reflection of “maturity”, but quickly added that Mnangagwa would not want to open talks with the MDC ahead of recommendations by the shootings commission. “I am realising that slowly sobriety is coming … but also with a good dose of common sense, which means we can now engage. “But at the same time, we must respect the commission and make sure we do not run ahead of its recommendations. “Let’s wait until the commission makes its recommendations and we will then see what the commission decides in its infinite wisdom about the proposals from the MDC Alliance, through its leadership … if it does, we will take it in our stride. If it doesn’t, then so be it,” Charamba said. Political analysts have said that the August 1 violence and the resultant deaths had done a lot of harm to Mnangagwa’s quests to mend years of frosty relations with Western governments. The post-election killings also cast a huge pall over Zimbabwe’s hopes of recovering from years of ruinous rule under former president Robert Mugabe.